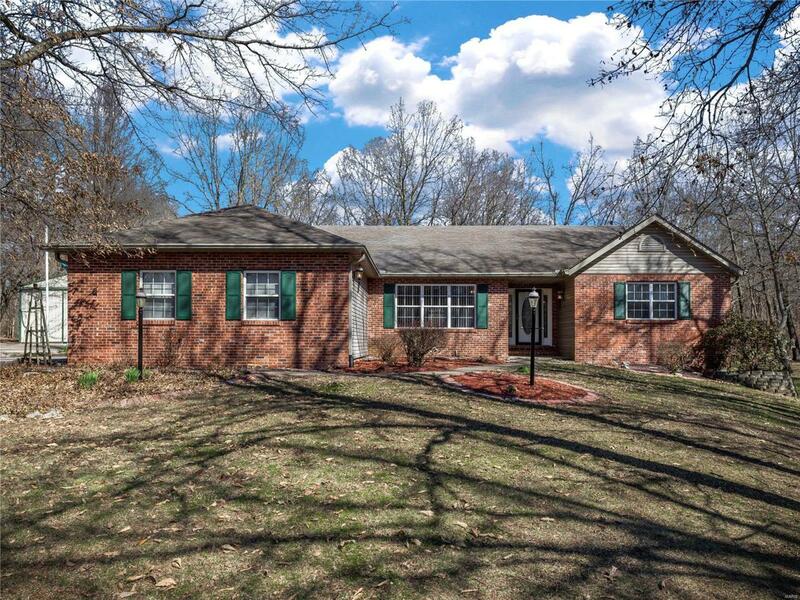 Ranch home nestled on a private 5 ACRE WOODED LOT on dead end street. Close to the interstate to take you to downtown St. Louis or downtown Springfield. Open floor plan/split bedrooms. Kitchen recently updated w/new flooring, granite counter tops, stone back splash & newer appliances that are all included with the home. Separate dining room has a large picture window to let in lots of natural light. Master suite has bay area that opens to the 31X12 covered deck and has a coffered ceiling. The master bathroom is huge with a whirlpool tub-separate shower-dual bowl vanity. Unfinished basement is plumbed for bathroom and has 3 egress windows. 50X40 POLE BARN has a concrete floor & separate 24X15 WORKSHOP. You can park a RV-boat-toys & still have plenty of space. Pole Barn is huge and dry! You can sit on the covered patio or around the fire pit & enjoy the serenity this property offers. Horses are allowed. You really need to come see this diamond in the rough to appreciate its beauty.